Pam, a graduate of Virginia Tech, joins Covenant as an Escrow Officer and Title Insurance Underwriter. 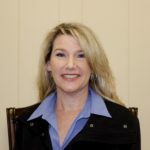 Prior to joining Covenant, Pam owned a title insurance and settlement agency for 10 years in the Smith Mountain Lake area. She has also spent almost 20 years as a paralegal in her father’s local general practice law firm. This experience has given her extensive knowledge of real estate law and practices, along with a complete understanding of the real estate closing process from beginning to end. Outside of Covenant, Pam’s favorite pastime is going fishing with her husband, Scott and her 3 boys, Zach, Zane, and Colton.